Brat Packer Andrew McCarthy stars as Jonathan Switcher, a regularly unemployed artist. While working at a mannequin design company (I guess they exist?? ), Jonathan designs and falls in love with one of his creations. His creepy behaviour around the dummy ends up getting him fired. Jonathan moves from job to job, always getting fired, until he stumbles upon the mannequin he designed in the storefront of a fancy Philadelphia department store. Jonathan ends up impressing the eccentric owner (Estelle Getty), and is hired to design their storefront windows. Jonathan finds his mannequin (Kim Cattrall) and to his surprise, the thing comes to life when they are alone. The two fall madly in love, and also end up designing the best shop windows in all of Philly, bringing some much needed exposure to the struggling department store. Jonathan becomes a target of rival store hoping to poach this new star, including his ex-girlfriend Roxie (Carole Davis). Things get complicated when Jonathan is photographed with his mannequin and Roxie threatens to release these photos to the public if he won’t come work for her. Can Jonathan and his wax model lover ever truly find happiness? Only time will tell. This is a lot of fun. The premise is so ridiculous, but it works because of the chemistry between McCarthy and Cattrall. The movie wastes time trying to explain why Cattrall comes to life and I kind of wish they didn’t do that. Giving us an explanation as to why this is happening isn’t necessary. The audience can see that it is happening and if they’re willing to go along for the ride, no explanation is required. Also, the story they come up involves ancient Egypt, and Kim Cattrall is probably the whitest, most un-Egyptian person I can think of. I really enjoyed G.W. Bailey’s performance as a bumbling security guard. He is clearly typecast by now after also playing a bumbling police officer in all of the Police Academy movies. He is the only one who has caught on to the fact that this mannequin is coming to life at night, and seeing him try and convince people is by far the film’s highlight for me (“SHE’S THE DUMMY!!!!”). A young James Spader also appears as a slimy executive looking to get ahead in the department store game. There is not much more to say about this film. It is an entertaining ninety minutes. This film isn’t going to win any awards, but you won’t feel like you’ve wasted your time by watching it either. Also, hang around for the end credits. The song made for this film by Starship (Nothing’s Gonna Stop Us Now) is 80s pop at its finest. 1980s cinema is truly magical. 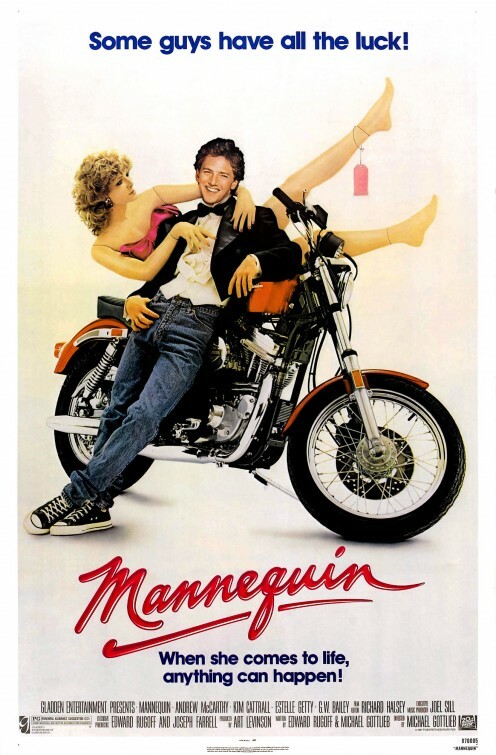 Not only did a film as ridiculous as Mannequin get green-lit, but it was sold to audiences with that obviously fake pre-Photoshop movie poster seen above and sent the cheesy pop-rock tune “Nothing’s Gonna Stop Us Now” to the top of the charts. It’s hard to imagine any of this happening today, but who knows? The movies being made today might seem laughable 30 years from now, too. For something that feels more like a TV movie than a theatrical release, Mannequin is surprisingly funny and charming. Andrew McCarthy is adorable. He really had that “boy next door” thing down, complete with self-effacing humor and mischievous grin. He plays an artist who builds the perfect mannequin, and then falls in love with it, as one does. Said mannequin magically comes to life only in his presence, taking the form of the gorgeous Kim Cattrall. The two work together to create creative window displays for the department store where McCarthy works, leading to him being promoted to vice president, because… why the hell not? This movie is about a mannequin come to life. One shouldn’t be surprised that the plot plays fast and loose with reality. This movie works because the cast completely commits to the premise and their characters, no matter how ridiculous. McCarthy and Cattrall are wonderful together. The other standout for me is James Spader. This actor has become typecast as the slimy villain, but here he plays a bumbling villain. It’s fun, because I get to both hate Spader and laugh at him. Mannequin is a lot of fun, so long as you don’t expect too much from it. It’s a typical 80s cheese fest, but sometimes that’s exactly what you want to watch.